I took the picture in a brief moment of calm. After the initial bird-in-the-flat flurry, I had stationed Tiggy to her mat, pulled the curtains, and was waiting for the pigeon to realise my kitchen was boring and depart. 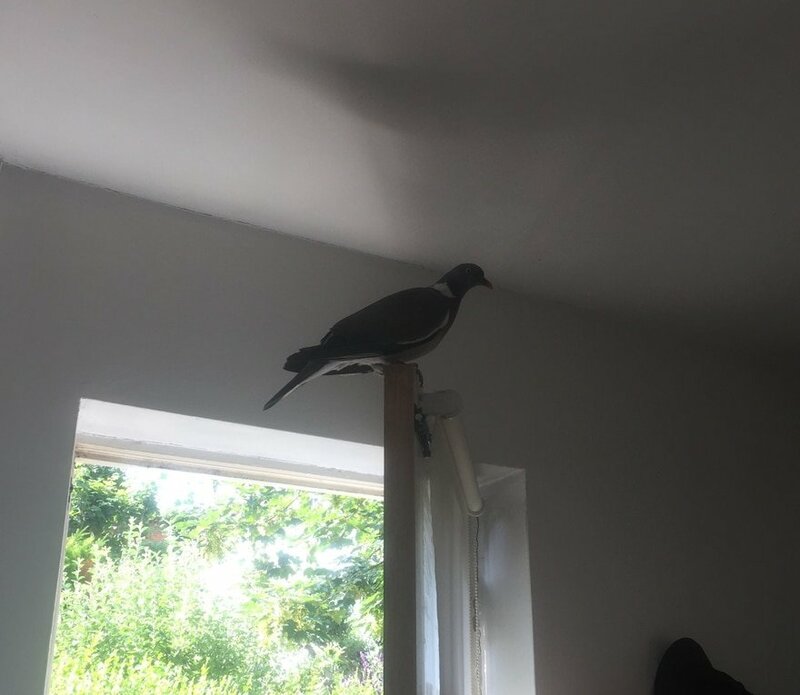 Two seconds later, the pigeon spotted the tiny chink of light between my kitchen curtains, decided this was the best available escape option, charged through the curtains and began to flail wildly against the closed windows. I am not a bird person. I am particularly not a panicking-bird-indoors person. I know how vulnerable birds’ little hearts are to fear and exhaustion. And my high-prey-drive lurcher was not going to be able to hold her position forever. There was a moment, a long one, where I lost the plot. I may have screamed “DON’T DIE, BIRD!” but happily there are no witnesses to confirm this. After that long moment, I remembered I am an animal trainer. This was a frustrated, terrified animal doing a behaviour that had been set up by a cluster of antecedents. Nothing more or less than that. I got to work. ANTECEDENTS: light source (outside), obstacle in front (glass), obstacle behind (curtain). BEHAVIOUR: movement forward at speed towards the light source. CONSEQUENCES: hitting the obstacle in front hard, being thrown back into the obstacle behind. I went outside and covered the windows. I heard and felt the flapping and the repeated impact of the bird’s body against the glass stop. After a count of five, I went back in and opened the curtains. The pigeon reorientated towards the back door and exited rapidly. I may have cheered. Again, no witnesses. I know pretty much nothing about birds. I know one when I see one, and that’s about it. What I do know, however, is that behaviour is behaviour is behaviour, in everything from flatworms to Oxbridge professors. We do the things that have historically obtained for us the outcomes we wanted. We go towards our reinforcers. We respond to changes in our environment that make those reinforcers more or less accessible or that require different strategies from us to get them. We behave. Tiggy remained stationed on her mat throughout this entire saga for the same reason that the bird continued to flail towards the light: reinforcement history. This is what gets me what I want or need, so I shall continue to do it so long as the context, the antecedents, invite it, and any aversive consequences (like slamming into a pane of glass) do not outweigh my need for that reinforcer. And that’s it. That’s all training is. If conducting a lightning-speed seat-of-my-pants functional assessment on a panicking member of a species I know nothing about could achieve such a dramatic result so quickly, imagine what we can do with the animals we know and love? what we could do if we all learned to apply these scientific principles as a matter of course to any behaviour we observe, so as to understand what need that behaviour was communicating and how best to meet it? 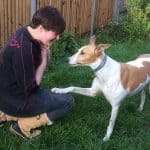 It’s a utopian vision of human/animal companionship, but it’s one that is gaining increasing traction in the world of animal care. Zookeepers are using this knowledge to train astounding levels of voluntary husbandry, drawing blood from fully conscious cheetahs. Alligators are learning to come when called. Elephants are presenting their feet for routine care. Endangered species are being trained to participate in their own conservation. Behavioural science is deepening our understanding of, and relationships with, other species, and the implications of this are mind-blowing. So this week I helped a pigeon escape from my flat. The question is – what do I do next week?